Internet service providers (ISPs) often provide a modem and router combo device, also known as a gateway router. These connect you to the Internet and also create a wireless network to connect all of your home devices. If you connect Norton Core directly to a modem/router combo, you create two home networks. Norton Core cannot protect devices that are on the wireless network of the combo device. This set up can also cause connectivity issues due to communication problems between the Norton Core and the modem/router networks. For maximum security and performance, disable the wireless network on your modem/router combo. You can then configure it in Bridge Mode to work only as a modem. This way Norton Core is the only router on your network and all of your connected devices are protected. The instructions to configure your gateway may vary depending on the make and model of the router. Visit the CenturyLink support page for the instructions specific to your router. 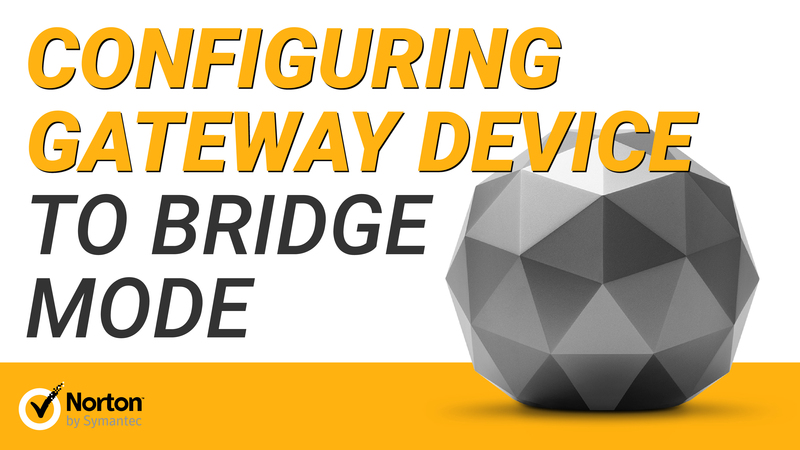 The instructions to configure your gateway may vary depending on the make and model of the router. For detailed instructions, read one: How do I set up my wireless cable modem? Your gateway router is now ready to use with Norton Core. Connect the WAN port of Norton Core to the LAN port of your gateway router using the ethernet cable that is provided with the Norton Core package.